Really enjoyed the food tour and was able to have the chance to try foods we hadn't tried before. Our guide, Raj, was very accommodating and nothing was too much trouble for him. Really enjoyed this tour. It was fab being in Mumbai at night and the food was lovely. Tour was great. Thank you to our guide Hitesh for showing us a great time. 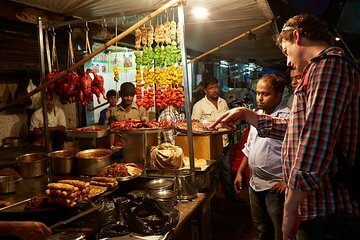 Did this tour second night in India it was a great foundation on what foods to try what is safe for us westerners to eat lol. Meat at Churchhill railway station. From there take a 3 station / 10 minute train ride to the beach where where we had Pani Puri other great treats. From there we take a taxi ride where you get to sample anohter 6 or so dishes I even asked about Lassie and our guide trotted off and came back with a glass for me very unexpected but loved it ! . They provide water bottles and hand sanitizer. Then after this we had Ice cream at a shop that has been around over 100 years then Jalebi the only thing that could have made the last thing any better was a cup of COFFEE ! lol.. I am a left leg amputee below knee and even i did not find this street food tour to much on me. My only regret is not doing the tour again the next day lol..My daughter still regards this as one of the highlights of our Indian tour. Keep up the great work guys ! .. Excellent tour, very well organised and gives you the opportunity to try some great street food. Knowing where to start and what to try and what everything is is so confusing as the way of life in India is so fast paced and busy, this tour made it so much easier. The guides were friendly and ensured that everyone got in to a taxi at the end of the tour. This tour is a fantastic way to get to experience food and locations that you normally wouldn't see. Our guide was knowledgeable and adept at leading us through the Mumbai streets. The food at Chowpatty Beach was tasty, and the vibe on the beach at sunset was lovely. The food near the Mosque area was also good, though a bit spicier. This area was incredibly chaotic and we were grateful to have a guide to show us around. The ice cream is superb! Great experience,going to different parts of the city by train and bus.Our guide janna taking us from the beach at sunset to the dense city,from savoury treats to sweet delights.All you can eat my favourite!! The guide was very knowledgeable and great to have a conversation with. Very positive and took us around the right places. However the price charged to the cost of the food we ate is too high as we usually tried the lower cost items. The explanation of the foods are good. I did get sick, diarrhoea and stomach ache afterwards for the next 5 days, but I think everyone that goes to India would expect that.